Burma, the "Golden Land," is a mostly Buddhist country whose history can be traced back to the Neolithic era. 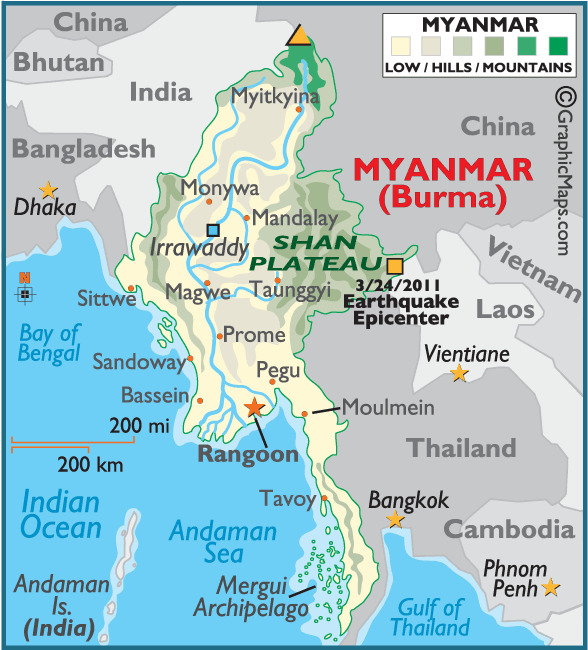 The first known city-states emerged in central Burma around the 2nd century BC by Pyu tribes who initiated trade with India and brought Buddhism to the region. [Pagan] Repeated attacks by the Kingdom of Nanzhao during the 8th century AD forced the decline of the Pyu culture, and by the late 9th century Nanzhao had founded a small settlement at Pagan (Bagan). The Pagan civilization flourished throughout the 11th century, and ultimately absorbed the surrounding settlements, forming the Pagan Empire. Together with the Khmer Empire, the Pagan Empire was one of the main powers of Southeast Asia at the time, and subsequently the Burmese language and culture dominated the land. However, the Pagan's were no match for Mongol invaders, and after repeated invasions the empire collapsed in 1287. The Mongols migrated out of the region shortly after the fall of the Pagans, and several smaller kingdoms existed, sparking an era of wars and switching alliances. In 1364 the successor state of Ava was founded in central Burma, and attempted to reassemble the Pagan Empire. Unfortunately, while it was successful in reigning the Toungoo and peripheral Shan states, it failed to conquer the remaining states, and was eventually overrun by Toungoo forces in 1555. [Tabinshwehti] Tabinshwehti, Toungoo's overly ambitious king, conquered a vast amount of Southeast Asia throughout the 16th century, becoming the area's largest empire in history. However, after the death of Tabinshwehti's successor, Bayinnaung, the empire began to unravel, before completely dissolving in 1599. Through the next two centuries, Burma fell under the ruling of numerous small kingdoms, and was conquered by the British in the 19th century and incorporated into its Indian Empire. In the colonial era, Rangoon was named capital of Burma, becoming an important port between Calcutta and Singapore. Civil unrest prevailed through the British ruling, and violent protests were carried out for decades. During the Second World War, the region of Burma became a major battleground, completely devastating the country, and causing the British administration to break down; thus allowing Burma their chance at gaining independence in 1948. Since 1962, the military has controlled the country, even failing to turn over the governmental power to the opposition party that won a landslide victory in the 1990 general election. On November 6, 2005, the administrative capital was moved from the city of Rangoon to the newly built city of Nay Pyi Taw. Much of this city is still under construction, and is set to be completed sometime in 2012. [Burma] The country of Burma is replete with natural resources, but growth and progress are stifled by strict government controls and serious financial mismanagement. In 2008, a "discipline-flourishing democracy" was promised, and a new constitution was drafted. General elections were held in 2010, and the military-backed Union Solidarity and Development Party was victorious. The beautiful and mysterious city of Rangoon is the principal port, and tourists are attracted by the city's large number of ancient golden pagodas (monuments to Buddha) that still stand.